Link from another blog detailing a flight into the aerodrome which sits in the valley bottom between Zell am See and Kaprun, the airport owned by the Porche family of Car fame. It is recorded in earlier times aeroplanes used to land on the frozen lake, (not much good in the summer) and then the grassy meadow was made into a landing strip, before finally becoming the runway for the Zell am See aerodrome. 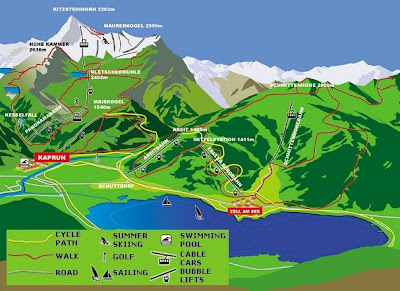 The attached map shows the location courtesy of Google maps, the aerodrome can be seen to the right of the picture below the word "moos", the lake at Zell am See can be clearly seen. Private flights can booked from the airport, with the possibility of flying over the Kitzsteinhorn glacier which stands at just over 3000 metres. It is possible to charter a plane with pilot for 30-6- minutes for that special occasion, for those who a technically minded attached is an aerial map showing the flight paths in and around the area of the aerodrome or in German flugplatz.